Black Fret awarded $230,000 in grants to our 2017 Artists on December 9th, 2017 at the Paramount Theatre. Warren Hood, & Whiskey Shivers. Black Fret awarded $220,000 in grants to our 2016 Artists on December 10th, 2016 at the Paramount Theatre. Black Fret awarded $150,000 in grants to our 2015 Artists on December 4th, 2015 at the Paramount Theatre. Black Fret awarded $130,000 in grants to our 2014 Artists on November 11th, 2014 at the Paramount Theatre. We use the term “Artist” to refer to either an individual musician or a band. We refer to Artists who are nominated for consideration for a Grant as “Nominees”. Nominees who are selected to receive a Grant become “Black Fret Artists”. What kind of artists get funded? 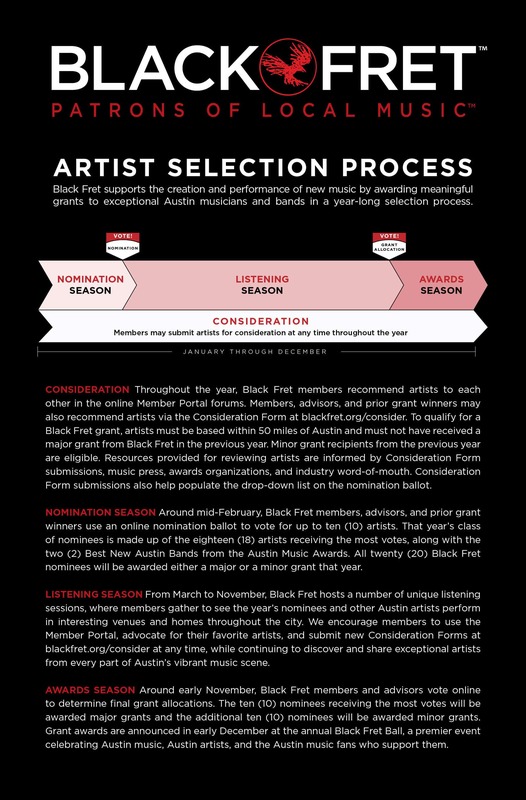 Black Fret provides grants to Austin’s internationally recognized local musicians as selected annually by our members, advisors and artists through our Artist Selection Process. The Selection Process has been designed to steer grants towards popular local musicians. These musicians typically play regularly in local live music venues and are covered by local press including the Austin Chronicle. Generally they are established name recognition musicians who choose to call our city home or rising musicians struggling to make a living pursuing their art. Consideration for a grant from Black Fret is by invitation only. There is no unsolicited application process. If you would like to be considered… play your music with every ounce of passion as often as you can. The fans will find you… and so will we. You may however submit your band for consideration by Black Fret staff and volunteers here: Bands for Consideration. Submission here does NOT provide visibility to your band to those members of Black Fret with the ability to nominate or vote for your band. It does NOT increase our chance of getting a grant nor of being invited to play at a Black Fret event. It only ensures the staff and volunteers who work for Black Fret have you on their radar. How can Artists support Black Fret? Are you an artist who would like to help Black Fret? If so, here are a few ways. Some of these will take you less than two minutes and will help us immensely. 1) Promote Black Fret to your fans: Help us spread the word about Black Fret. Post a link about Black Fret on your Facebook page right now. Then do it again every once in a while. Mention us in a newsletter or at a show. Some of your fans will definitely be interested in joining Black Fret. For those fans who work for major employers with corporate match programs (think Dell, Apple, Bank of America, etc.) the cost is only about $30 a paycheck. Remember our Members nominate and vote for artists to receive grants. If your fans become members you become more likely to receive a grant from Black Fret. 2) Share Your Story: Give us a quick view into your life as a musician. Examples: What brought you to Austin? What are the challenges you face? What has been your greatest moment? Who has helped you the most? What would a grant from Black Fret mean to you? 3) Endorse Black Fret: Provide us a quote or two about Black Fret and a photograph of yourself along with your permission to include these things on our website, in our communications and marketing materials. Your endorsement is just about the most important thing you can provide us to help us demonstrate the need for Black Fret to our members and potential donors. 4) Host a Private Recruiting Show: Do you have ten or twenty select fans who you think might be interested? Let’s arrange a short acoustic set and happy hour for them. A Black Fret member will attend and give a short overview of the organization and answer any questions folks have. We promise no hard selling, just us explaining the model, benefits and importance to our community. 5) Join as a Black Fret Member: No one knows more about great music or recognizes great talent more than other artists. Our artist members have a critical role in acting both as A&R scouts and as taste-makers influencing the nominations and ultimately the votes of other members. In return membership will help you keep your finger on the pulse of rising talent. Black Fret is here to help Austin’s musicians. For that reason your support of us means so much more. Thank you for taking the time to help Black Fret! The following is an open letter to Austin’s musicians from the Board of Directors of Black Fret. We understand that as musicians you frequently hear stories that are too good to be true. Black Fret probably sounds like one. We understand that you’ve dedicated years of your life to perfecting your art and that protecting your art, and the livelihood it provides, is important to you. With that understanding we respectfully ask that you spend a minute understanding us and our commitment to you. We grew up in Austin. Austin’s music and clubs defined our youth. Together the Board of Directors of Black Fret has been volunteering for local music non-profits in Austin for more than forty years. We know that you’ve invested lots of time and money perfecting your art. We’ve committed the same trying to perfect a non-profit business model to serve Austin’s musicians. We think Black Fret is the answer. We are committed to making Black Fret a reliable, valuable and equitable organization built to provide grants to a large number of Austin’s local musicians. Membership directed grants are just the start. As an institution Black Fret will be empowered to raise money from many other sources. Those funds can be used for a variety of other grant programs to support our music community. Our vision for our core, membership directed grants is that they become a globally recognized symbol of artistic excellence and, that in doing so, they will create new opportunities for Austin’s artists beyond just the value of the grant. That being said, we know that money is the gas in the tank. We want those grants to be large enough that they allow an artist to undertake a significant project, tour or transition that they wouldn’t without the funds. There are some responsibilities that come with accepting a grant (see Black Fret Artist program) but we think they are minimal, give our donors some assurances, and in no way give Black Fret any rights or claims on your songs. As far as we know nothing like Black Fret exists anywhere else. That means we are learning as we go. We believe strongly in building equitable processes that result in supporting artistic excellence without bias. We are listening and we are learning. If you don’t like something you see with Black Fret or if you just want to know the folks driving it… please contact us. We’ve met with scores of Austin’s musicians in building the Black Fret model but know that there is always room for improvement. We would welcome your help in building Black Fret into the next great Austin music institution. Thanks for taking some time to get to know us.